attended a mandatory meeting where ASI staff including Executive Director Ilaria Pesco and Elections Coordinator Jason Watkins went over the elections code with the candidates. 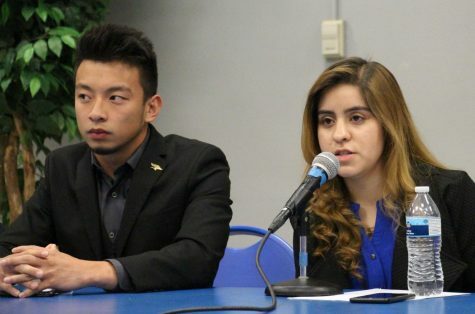 The executive positions for president and vice president have more than one candidate running after two years of having unopposed candidates. Last year, all five executive positions ran uncontested. This year, only the Vice President of University Affairs is running uncontested. Despite having more than one candidate on the positions a few of the positions are still vacant. In past years, students’ lack of participation has resulted in filling ASI positions through applications after the elections are over. 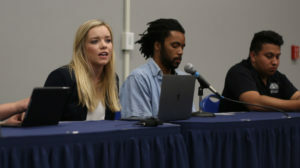 A candidate debate is scheduled for April 2 and two voting stations will be placed at the Student Union Patio and Red Brick Road on April 3 and 4. Yoder stated that the process of campaigning information ASI provided this year was helpful. “It was like dipping your toes in the water instead of jumping right in, real fast,” said Yoder. Presidential candidate, Aaron Wan, experience campaigning last year when he ran for vice president of campus life. 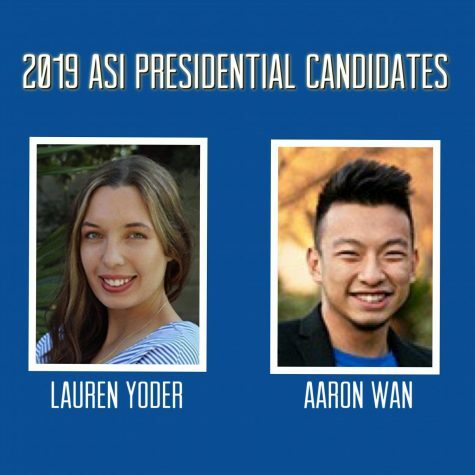 “I believe that it was very successful this year because ASI was able to provide multiple opportunities for students to learn about various positions as well as how to campaign. We hit multiple barriers that prevent students from running such as lack of information and the election process in general,” said Wan. 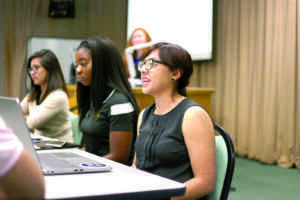 Vice president candidate, Monica Figueroa, said that the information workshops ASI hosted were beneficial that allowed her to interact with the current executives, ask questions, and work on her personal statement. 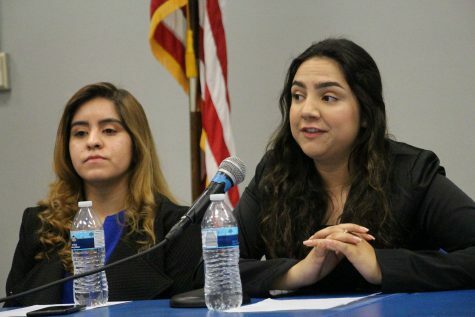 Roxanne Esparza, candidate for vice president, stated that she, too, felt welcomed because ASI was there to navigate her through any questions. Pesco hopes that this year’s election brings more student voter turnout. 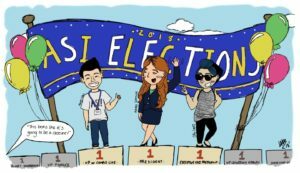 In 2018, only 7.4% of CSUB students voted, 7.5% in 2017, 14% in 2016, and 23% in 2015. Since this past Friday, candidates were allowed to start their campaigns and they have until April 4 to promote their platforms to win the students votes. The following are all candidates for executive positions. The following questions were made by The Runner staff reporter, Ivette Nolasco, and responses were written by the candidates. Roxanne Esparza is an Engineering Sciences major. Monica Figueroa is double majoring in Political Science and Criminal Justice. 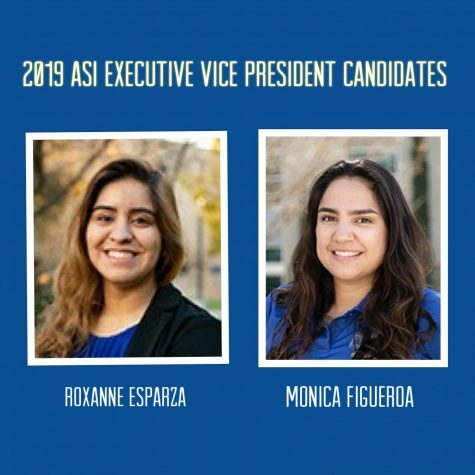 Both are running for ASI Executive Vice President for the academic year of 2019-2020. What is the platform you are running on and what is your vision for the position? ESPARZA: I plan to continue the amazing work that is already being done by our current ASI team. My goal is to make a difference by actively listening to students’ concerns or questions they may have and taking action to help them. Increasing involvement on campus and inspiring the success of students are my goals. My vision is to inspire students to fearlessly chase their dreams. 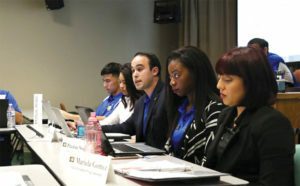 I want to inspire the next generation of leaders and promote greater connection among students at CSUB. FIGUEROA: My platform is the one of equal representation, accessibility, and effectiveness. 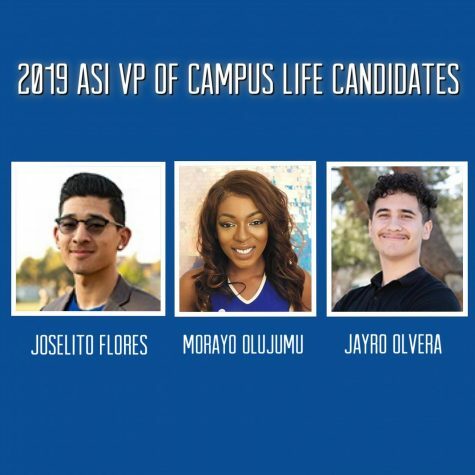 My vision of the Executive Vice President position is to allow students to see how the ASI team works and I plan to achieve this by allowing students to experience and see how it is that their representatives work. An idea is that once a week, a student could work with someone on the ASI team and see how everything is done to achieve the students wishes and goals. This can be effective to the improvement of ASI because if one of the students later plans on becoming a part of the ASI team then they will have an idea of what is expected. What makes you the best candidate for the position you are running for? ESPARZA: I am persistent, hard-working, and committed towards my goals. I will not let you down and I will work endlessly to represent students at CSUB. I am passionate about my community at CSUB and dedicated towards making a positive difference in Kern County. I organize myself and work to get things done on time. FIGUEROA: I am an approachable and interactive person, which is a necessary quality to represent the students. Student representation could only be done through the ease and trust of the students on approaching their representatives to communicate their concerns and ideas. In this manner, ASI will be able to run effectively on what it is the students need and want on their campus. I am organized, dedicated, and motivated to what is best for the students on the CSUB campus. By taking 18 units in school, having a job as a City of Bakersfield lifeguard and coaching the Junior Varsity swim team at Golden Valley High School, and being involved on many clubs and organizations on campus I have learned to be organized and manage my time effectively. With organization, I am motivated to dedicate and present my best self in all my activities and making sure that everything is done effectively and swiftly. What Kind of leadership background (if any) do you have that could be applied to your position in ASI? ESPARZA: My experience as a community volunteer has prepared me by giving me the opportunity to work with others on projects that benefitted the Bakersfield community. I have experience working with teams at CSUB, Adventist Health, Bakersfield Ronald McDonald House, Latina Leaders of Kern County, and Kern Behavioral Health and Recovery Services. Being a part of the ASI L.E.A.D. program and Sensational Sophomores has made me a stronger leader. FIGUEROA: I am currently the President of the Sensational Sophomores Leadership Program which promotes community involvement, building leadership skills, creating campus wide connections with students and administration, and their development as future leaders to academically responsible freshman. In this role, I work with the Sensational Sophomores executives on organizing and leading meetings, managing outreach sources such as social media and class presentations, and volunteering in several campus events and community projects. 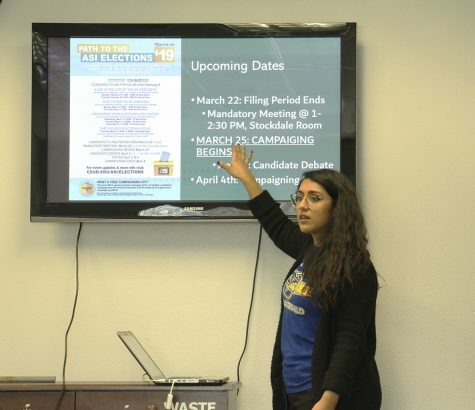 Name the top areas you would focus on and/or advocate on behalf of all CSUB students if elected? ESPARZA: Opportunities. Community. Support. I will focus on creating more opportunities for students by reaching out to organizations and businesses that can provide students with job experience. I will focus on encouraging more community service and inspiring students to become a part of projects on and off campus. I will advocate for mental health and work to erase the stigma by creating a program where students can support students throughout their academic journey at CSUB. I plan to strengthen the connection among ASI and students. What is your main purpose or reason for being a part of ASI? ESPARZA: I want to work hard to help students thrive. I see the work that is being done by the ASI team and this has inspired me to run for this position. I see a dedicated and passionate team that works diligently to voice our concerns and questions. It would be greatly rewarding for me to assist students and represent them as one of their leaders. I would like to inspire more students to become involved on campus and realize their full potential. I want to give back to the community that has given me joy, opportunities and support. With a humble heart, I want to use my experience, perseverance, and hard work to solve problems, empower and help students to seek success, all while making a positive difference in the community. FIGUEROA: I strongly believe that equal representation and the liberty of expression should be encouraged and accessible for all students. Being a part of ASI will allow me to listen and understand what the student’s desires for improvements on campus would be and being able to represent them would be an honor. Knowing that while working long hours alongside a team, that we are making a difference for the students’ campus experiences and encouraging them to get involved and make memories would be rewarding. Morayo Olujumu is double majoring in Business Administration with concentrations in Management and Marketing. Joselito Flores is a Liberal Studies Major. Jayro Olvera is a Nursing major. All three are running for Vice President of Campus Life. Enhancing the quality of life for housing residents. Working with diversity clubs and the CSUB MAGEC Center to host inclusive events that are educational and entertaining. Providing students with an open forum to express their ideas on potential campus events. Encouraging more club socialization and collaboration. Focusing on increasing campus spirit. Providing resources and solutions for students to stay on track for graduation. Creating a “Life Skills” workshop for students to learn skills that are not necessarily taught in the classroom. Creating more networking opportunities between students and surrounding communities. Providing resources and solutions for low-income and middle-class students. FLORES: As VP of Campus Life, I want to emphasize my focus on inclusivity in programming. What this means is working with ASI Directors and departments to create programs that celebrate the diverse palate of students we have. This means social diversity (such as heritage, religion, gender identity) and academic diversity (such as first-generation students, transfer students, and other untraditional students). In addition, I want to enhance the way we reach students on existing programs, meaning ASI will reach students that are currently disconnected from campus life. My main vision is to engage students in a more proactive and meaningful way and make students feel like CSUB is their home away from home. OLVERA: I want to bring exciting events to campus to make our experience here at CSUB more memorable. One of the many things I will do for you is bring more life to the SU patio. My vision for CSUB is students filled with a ton of school spirit and love for our wonderful school. I will be the one who makes you want to spend as much of your time here on campus. OLUJUMU: I believe I am qualified for the position of Vice President of Campus Life because I am very involved on campus. I am the President of the African Student Association, Gold Member of the LEADER Program, and senior veteran of the CSUB Cheer Team. I have an extensive amount of experience for planning and hosting large events on campus. My other qualifications include: strong community engagement skills, budget and project management experience, professional-managerial experience, extensive planning committee experience, campus diversity and inclusion advocate, champion for campus spirit. FLORES: My drive and experience in leadership roles is what makes me the best candidate for VP of Campus Life. 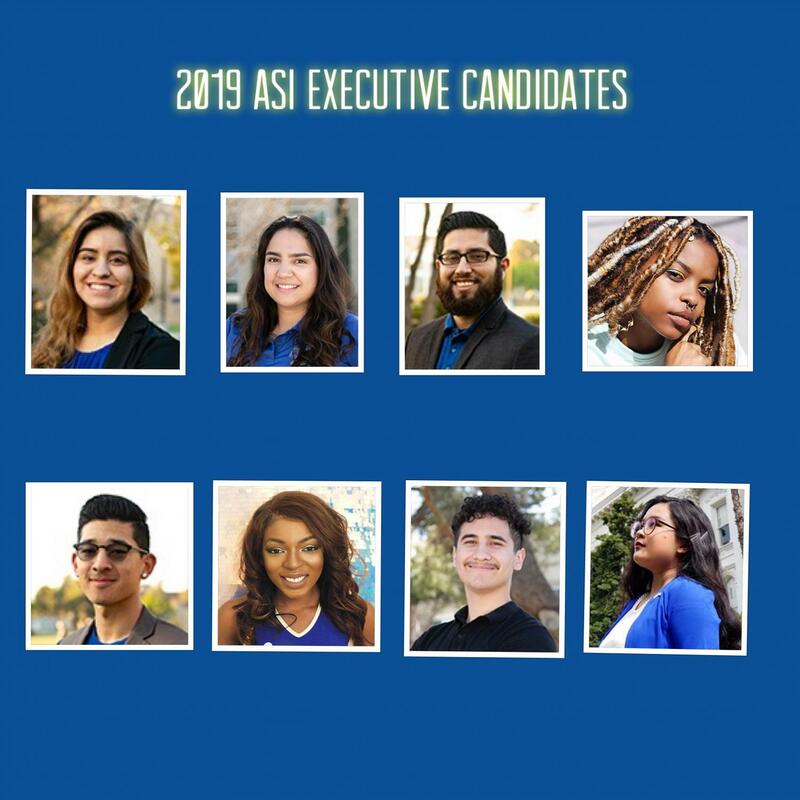 In addition, my experience in ASI and in this type of position gives me the edge that will allow me to hit the ground running if I am elected into office. OLVERA: I am very dedicated, goal driven, and a fearless person. My dedication will be for my fellow students, I will be the one who will hear their concerns and give them what they are looking for. Any goals I set will be met and exceed expectations. Nothing will stop me and I will bring the right things students need. OLUJUMU: I am the President of the African Student Association, Gold Member of the LEADER Program, and senior veteran of the CSUB Cheer Team. I these positions I have connected with different CSUB students and learned to understand their needs and wants. In addition, I have an extensive amount of experience for planning and hosting large events on campus. I have been a part of different standing committees for events on campus such as Black History Month. As the President of the African Student Association, I have hosted and planned multiple campus life events such as Afro Rush Week, Trap Karaoke, Afro Zumba, Afro Experience: LGBTQ+, annual African Culture Show, etc. FLORES: In terms of leadership experience, I have been entrusted in multiple different leadership roles. To start, I have been the Men’s Track and Field Team captain for 2 years now and I have learned many valuable lessons. Along with this, I attended the National Young Leaders State Conference (NYLSC), where I was taken through class and workshops that developed leadership skills. OLVERA: I was on the leadership team at my old high school where I did a lot of engagement with students. My goal everyday was how can I get these students more involved with campus. OLUJUMU: Working with diversity clubs and the CSUB MAGEC Center to host inclusive events that are educational and entertaining. Providing students with an open forum to express their ideas on potential campus events. Providing resources and solutions for students to stay on track for graduation. FLORES: The top three areas that I would like to focus on this year are inclusion for all students, increased engagement/activities, and increased knowledge of resources available. OLVERA: I want to create a campus filled with school spirit, create new ways for students to be able to de-stress after midterms and finals, and finally find new ways to create more memories of our time here at CSUB. OLUJUMU: For the past four years, I have dedicated all my heart and effort to increase the quality of life for our fellow Roadrunners. Now is the time for me to use my talents and experiences for a higher purpose: making your life on campus the best it can be. CSUB is your university, and you deserve individuals who will advocate for you to the best of their ability. I hope you all will elect me as your ASI Vice President of Campus Life for the 2019-2020 academic year. FLORES: My main purpose for being a part of ASI is to help give back to the students. As stated in question two my focus is inclusivity and I want to foster a campus environment that allows for students to know that they and every part of their individuality is welcomed and celebrated on our campus. OLVERA: I am running for an ASI position so I can continue to reach out to new people and show what a fearless leader I can be. Andria Scott is a Psychology major and Business minor. Ulyses Rodriguez is a Business Administration major with a concentration in finance. 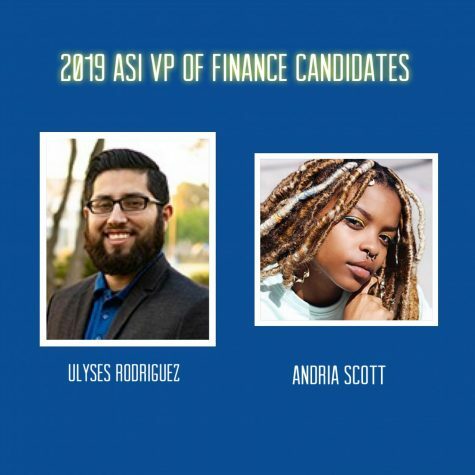 They both are running for ASI Vice President of Finance for the 2019-2020 academic year. SCOTT: I want to introduce resources for students to gain financial literacy and autonomy, such as how to build credit and balancing a budget. I also feel that it is important to provide clubs with resources and ideas to raise funds. RODRIGUEZ: My platform and vision are to help students be financially prepared for life after college and to bring more financial literacy programs and courses to the students of CSUB. SCOTT: I have had many years of experience within student government as well as finance positions. I have been affiliated with clubs and sports on campus and I care about the concerns and livelihood of each student at CSUB. RODRIGUEZ: I believe I am the best candidate for this position due to my leadership skills and experience. I have a passion for helping students and passing on what I have learned from my mistakes and the lessons of my mentors. SCOTT: As Director of Treasury at the Albert Einstein Academy, I managed and created spreadsheets for the school budget, talked to vendors and sponsors and created various fundraisers. As a member of the Business Academy, also at Albert Einstein, I gained skills in networking and communication, money management, business management, and budget development. Working with Vector Marketing, I learned from and networked with some of the best business people across our region. At Vector, I managed clients’ budgets, assisted with creating financial plans, and gained proficiency in sales management and cash handling. RODRIGUEZ: I am currently serving as an Associate Justices with the ASI Judicial Council. I been an officer in Veterans club since the club was founded, serving as the treasurer. I served eight years in the United States Marine Corps obtaining the rank of sergeant and serving as an administrative specialist working within the field of finance. I have been involved in the Head Start preschool organization and the Community Action Partnership of Kern (Cap-K) Non-Profit organization, working my way from attending monthly parent meeting to being selected to the regional representative, then selected to the policy council where I served as the Parliamentarian officer and chairman of the By-laws committee and then finally selected as a representative on the Board of Directors for Cap-K. I have also been heavily involved in the Veterans Department at CSUB where I have led many events and celebrations. I have interned as a financial literacy instructor through a partnership with the school of BPA and Wells Fargo Bank teaching finance to middle school students. SCOTT: If elected I will provide resources to help clubs and organizations raise funds for their club accounts, utilize the Investment Center to host workshops for students to gain hands-on experience with the stock market, promote events that allow students to excel in financial literacy, and address the issue of providing solutions for low-income and middle-class students. RODRIGUEZ: I would focus on bringing more financial literacy programs to help students have a brighter financial future, assist clubs and organizations navigate through the ASI funding request to help more clubs have successful student events, with a concentration on helping the students of the CSUB Antelope Valley campus. My final focus is to create better awareness and accessibility of current programs to the students of CSUB, we already have great resources and that not many students know about. SCOTT: Over the course of the past four years, I have accumulated many ideas on how I can implement my skills in an effective way for Roadrunners. I want to work hard to change the environment we have on campus. I wish for students to feel taken care of and at ease while they are attending school. Life is already hard enough, going to school should be the easy part. Therefore, I will do everything in my power to make sure that students are getting what they need and deserve. RODRIGUEZ: My main reason for being a part of ASI is that I truly love serving my community. I am so proud to be a Runner and I have dedicated myself to helping my fellow students around me. I want to give students the tools and knowledge to best prepare themselves for life after college. I know if given the chance I can help our runners succeed. #TogetherWeClimb. Krystal Raynes is a Computer Science and Business Administration double major. She is running uncontested for ASI Vice President of University Affairs. RAYNES: ADVOCACY: Champion for your rights, no matter your documentation status. As your current Director of Legislative affairs, I’m experienced with lobbying on Capitol Hill and asking the tough questions to get CSU funding, Basic Need funding, Cal Grant reform, and educational rights for AB 540 students. Let’s have your voices heard. SUSTAINABILITY: Keeping one time use items to a minimum. Investing in biodegradable cutlery on campus, encouraging bring your own bottle policies, and reducing single use plastic bags. Let’s make tomorrow greener. COMMUNITY: Bringing community sponsors and Kern County key players onto CSUB’s campus. Spearheaded events like Lunch with Our Legislators. Bringing inspiring speakers and businesses. 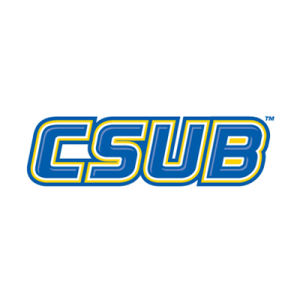 Let’s create a brighter future for CSUB. 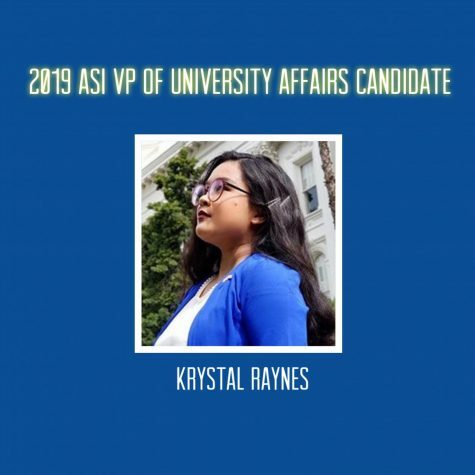 RAYNES: My main purpose serving in ASI is to set the foundation for a better represented student voice, cleaner campus, and more community engagement. The following is a list of candidates running for ASI director positions.